PMIs of manufacturing equipment and high-tech products came in at 53.0 and 54.8, up 1.3 and 1.0 points respectively from April, and higher than the headline PMI of 51.9 in May, which was already above the 51.4 in April. These two items have been consistently higher than the headline figure. This shows that China already has the fundamentals to build even more advanced technology. Manufacturing of consumer goods was also strong at 52.7, and stabilised from last month. Combined with new export orders PMI at 53.8, up from 52.9, which has been higher than new export orders at 51.2, this shows that consumption demand in China is solid. Strong consumption demand is also reflected in large demand for electricity for cooling from the hot weather in the southern part of China, and the high-energy-consuming manufacturing PMI rose to 50.5 from below 50. Although high-energy consumption is not as positive from an anti-pollution perspective than clean-energy production, the high demand for electricity for cooling implies that the overall population generally can afford a higher electricity bill for a more comfortable life. This exposes the risk of China not having enough clean energy production and infrastructure investments. Inbound tourism, air flights and shopping activities during the Golden Week boosted the non-manufacturing PMI to 54.9 from 54.8. We have to bear in mind that most service businesses, like banking, were closed on holidays. That explains a small increase in the non-manufacturing PMI. The PMI figures confirm our view that the Chinese economy is running at a decent speed. Combining this with April's industrial profit data, we confirm that our GDP forecast of 6.8% for 2Q18 stills holds. 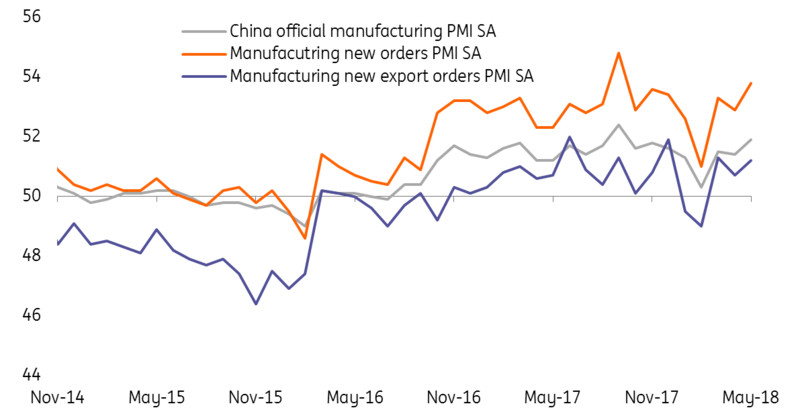 Forthcoming trade tensions could put pressure on trade and related supply chain activities, however. We believe that investment decisions in potentially affected industries have been delayed. Still, the government together with corporates have increased investment to develop the highest-end technology in the semiconductor, telecommunication and transportation sectors. We are therefore optimistic about the overall economy.